When it comes to diet and lifestyle choices, older adults are well advised to practice moderation. Whether it concerns weight management, physical activity, or alcohol and tobacco use, health experts urge people to consider their limitations and changing needs as they approach their senior years. Several recently published studies on aging all seem to lead to the same conclusion: when it comes to diet and lifestyle choices, older adults are well advised to practice moderation. Whether it concerns weight management, physical activity, or alcohol and tobacco use, health experts urge people to consider their limitations and changing needs as they approach their senior years. One such study, led by researchers at the National Institute on Aging (NIA), found that gradual calorie restriction in mid-life could help lower the risk of many diseases later on. The findings confirm what has previously been shown only in animal studies, namely that reducing food intake could have a positive impact on aging and longevity, thereby supporting the message that weight control becomes ever more important in the second half of life. Similarly, experts recommend age-appropriate behavior when it comes to exercise. While physical activity is crucial for healthy aging -- as it is for good health in general -- there are limits to what people can endure as they grow older. Of course, much depends on a person's individual fitness level, but certain precautions should be observed regardless. The good news is that even smaller doses of regular exercise (emphasis on regular) can produce significant benefits, not only for the aging body but, equally as important, for the mind. 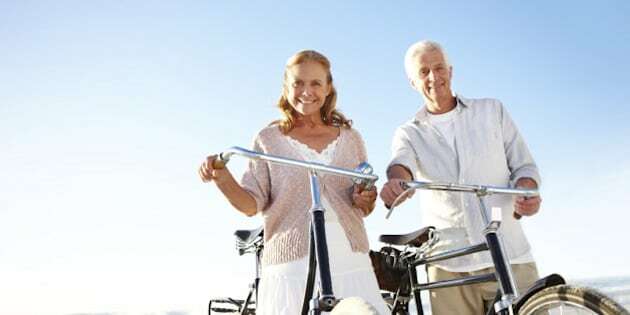 As studies have shown, even less strenuous activities like walking, bicycling, or swimming can help improve heart health as well as cognitive abilities. But for seniors, trying harder may not necessarily lead to better results. It has often been suggested that drinking alcohol, particularly red wine, may be beneficial for the heart. To be sure, those claims are not beyond dispute, and the jury is still out on what alcohol actually does for people's wellbeing other than make them feel good. What is well established, however, is that consuming high amounts is dangerous and can have enormously detrimental consequences in multiple ways, including for aging. As it gets older, the human body becomes increasingly vulnerable to the effects of alcohol and is less able to handle its toxicity, according to research. That is why the National Institute on Alcohol Abuse and Alcoholism (NIAAA) recommends for seniors no more than one glass of alcoholic beverages per day. It goes without saying that avoidance or cessation of tobacco use is a good idea at any time, but, again, it becomes a more pressing matter at an advanced age. Most of the studies mentioned reaffirm other findings of the past. For instance, according to the guidelines for healthy aging by the Centers for Disease Control and Prevention (CDC), all adults over the age of 50 should be conscious of their changing health needs. Dietary choices should depend on activity level and other factors like eating styles, food sources, and so on. Following a regular exercise regimen can be instrumental in slowing down the natural aging process, but age-related limitations must be taken into account. Some lifelong pleasures and habits like drinking or smoking may no longer be tolerable. Counseling and other support measures for cessation may be helpful. Another topic that is often not considered enough is the psychological component in all this. If those guidelines and recommendations are perceived only as restraint or deprivation, they will be hard to adhere to. Old habits, as the saying goes, die hard. As we grow older, we all experience losses and are forced to let go. For this, it is of great importance to see the larger picture and appreciate the immeasurable value of good health, without which nothing else matters.